Mark Zuehlke is an expert at narrating the history of life on the battlefield for the Canadian army during World War II. 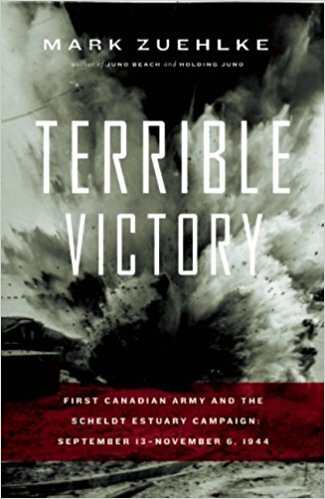 In Terrible Victory, he provides a soldiers-eye-view account of Canada’s bloody liberation of western Holland. Readers are there as soldiers fight in the muddy quagmire, enduring a battle that lasted three weeks and in which 6,000 soldiers perished. Terrible Victory is a powerful story of courage, survival, and skill. Naval ratings having dinner aboard the Canadian-manned aircraft carrier H.M.S. NABOB, Vancouver, British Columbia, Canada, January 1944.